Climb your way to the evil of Volskygge. Word for the Whirlwind Sprint shout. Note: This quest does not appear in your journal (see this section for details). Fight your way through the ruin. Defeat the dragon priest Volsung. "It is a cursed place...!" 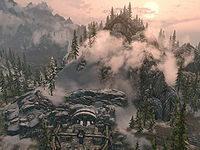 When you visit Solitude, the local guards may warn you about an ancient Nordic ruin called Volskygge, saying: "If you must venture southwest, stay clear of Volskygge. It is a cursed place, a tomb where the dead still live...." Talking to experienced traveler Jawanan will net you even more information: "Inside, there is said to be a wall, black as night. And it speaks! In the ancient Dragon tongue!" If you heard about Volskygge from the guards, a map marker will be added; otherwise you will have to locate it yourself. The ruin lies far to the west of Solitude, past Dragon Bridge, and just south of Lost Echo Cave. Three leveled bandits guard its expansive exterior and draugr inhabit hidden, booby-trapped rooms, portending dangers to come. The ruin's large interior contains many locks and hosts a myriad of enemies, so carry a good supply of health potions and lockpicks or the Skeleton Key before entering. Inside the ruin, pass through the first gate and into a throne room protected by a dart trap and two bandits patrolling back and forth. Proceed westward through a tunnel, wary of a pressure plate that triggers a spiked wall trap. Ahead stands another bandit near a locked chest that contains minor loot. 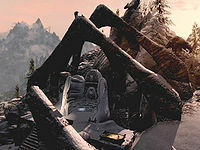 The northern tunnel leads to an intersection; the path to the west from this leads to a room in which a Nord and an Orc bandit try to break into a cage (see this section). Fighting the bandits here is optional, although unlocking the cage leads to a handle that will lower a nearby wall and provide access to a secret room with minor loot. You will find a copy of the Lockpicking skill book Surfeit of Thieves on the shelves near the secret wall. From here, backtrack to the intersection and continue east into a huge dining hall littered with dead draugr through which two more bandits wander. The rooms to the north contain little of interest, so leave the area through the eastern door, but tread carefully: the dead bandit you'll see on the floor was killed by a battering ram triggered by a pressure plate just inside. Don't meet the same fate. "All must be activated in order, if you wish to go home." The first fears all, The second fears none. The third eats what it can, Preferably number one. The fourth fears the second, But only when alone. All must be activated in order, If you wish to go home. If done correctly, the adjacent iron gate will open, providing access to another room containing a spiral staircase, a chest and a secret passage. The passage is opened via a lever on the left of the two pillars on the northern wall, leading to a dart trap and a few minor items. Turn back and take the spiral staircase down, which leads to the next zone of the ruin, Volskygge Passages. 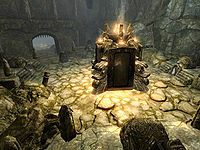 The first few rooms of Volskygge Passages are empty, except for a soul gem on a pedestal and a handle that opens to a small room holding absolutely nothing (see notes). In the third chamber, a leveled draugr guards two more soul gems. After the battle, pull the handle next to the iron gate and head west, past the inactive trap door in the first chamber and a set of swinging blades triggered by a pressure plate. In the next chamber, you will find a dead bandit near a handle which provides access to yet another secret chamber in which a potion of ultimate healing stands atop a weight sensitive plate. There is also a trap door near the dead bandit, offering an alternative route through the ruin. Regardless of your choice you will end up in the catacombs and face several draugr. Follow the only available path as it twists and turns, fighting the undead enemies as you go along. From the point where vines begin to overgrow the path, proceed with caution as the draugr can gang up on you, making the fight more difficult than it has to be. Head up the northern stairs and fight a strong draugr in the northern room, then locate the western stairs, avoiding another battering ram as you move along. Soon, the path will be covered with webs, and three frostbite spiders will come rushing towards you, with another four lurking behind a thick web. Fight your way through the nest, and prepare to fight yet another wave of spiders when you reach the waterfall. After slashing your way through another web, you will find yourself back in the ruin, in a huge central chamber haunted by undead. A hidden treasure lies in the watery path to the west. Head up the southern stairs for a battle against a boss-leveled draugr, and claim your reward from his chest. Head up the final set of stairs and exit the ruin through the door, leading to the second exterior zone, Volskygge Peak. You will now stand atop the mountain where you initially entered. The demonic chanting you'll hear will tell you that the rumored "black wall" is nearby. Head up the stairs and approach the word wall for one of the words for Whirlwind Sprint. 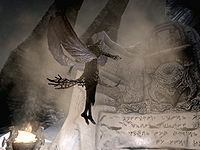 As soon as you have learned the word, Volsung, a dragon priest will burst from the sarcophagus behind you. A powerful foe, he uses only frost attacks in combat. After the battle, loot his remains for his unique dragon priest mask. This "quest" only controls the dialogue for the bandits and will automatically complete entirely within the first section (but see bugs). Killing Volsung is not actually part of the quest. It's possible to reach both Volsung and the word wall by simply running up the mountain. A strange gem was meant to be part of the Volskygge puzzle, but never made it into the final game. Some dialogue between the bandits was supposed to add a bit more spice to the story about Volskygge. However, the quest trigger was wrongfully placed in the dining hall just before the entrance to Volskygge Passages, so the dialogue will rarely be heard. Stealth through Volskygge without killing anyone until you reach the spiral staircase just before Volskygge Passages, then make your way backwards to the entrance. The dialogue will be heard normally along the way. Nord "This is getting ridiculous. If we can't get this open soon, the boss will have our heads." "I can't get it open." Orc "You've been at it for five minutes. Here, let me try." "I think I almost got it." Male "Find anything worthwhile yet?" Female "Can't say that I have." Male "Quiet! I think I heard something." Female "This place has had you shaking in your armor ever since we arrived." Male "I'm fine, I'm fine. Let's move on." All of the quest stages are empty: 0, 10, 20. On the PC, it is possible to use the console to advance through the quest by entering setstage dunVolskyggeQST stage, where stage is the number of the stage you wish to complete. It is not possible to un-complete (i.e. go back) quest stages, but it is possible to clear all stages of the quest using resetquest dunVolskyggeQST. This page was last modified on 3 November 2018, at 12:07.